glo have challenged Emma from From Aldi to Harrods and I to swap blogs for the day. I have written a money saving post for From Aldi to Harrods while Emma has written a delicious recipe for Hijacked By Twins! 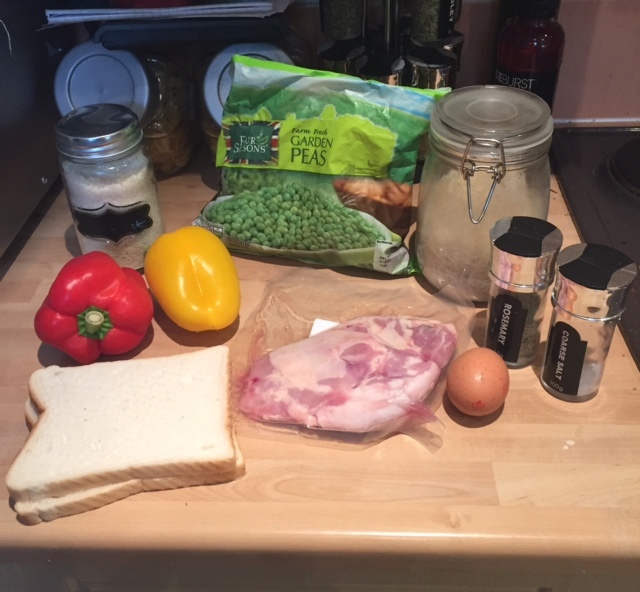 fancied making something and made up the recipe with a little bit of research. 1. Pre-heated the oven to 180C. 2. Put a kettle full of water on to boil. 3. Chop up the peppers. 4. When the oven is hot, place the chopped peppers on a tray and drizzle with olive oil, using rosemary and salt to reason. Place in the oven for 20 minutes. 5. Put the rice in the pan and cover it was boiling water. Place a lid on the pan, remembering to stir it after 10 minutes. 6. Toast the bread, and once toasted put it in a food processor or blender to make breadcrumbs. 7. Beat the egg into a bowl. 8. Mix the breadcrumbs, coconut and chilli flakes in a bowl. 9. Place a frying pan on a medium to high heat. 10. 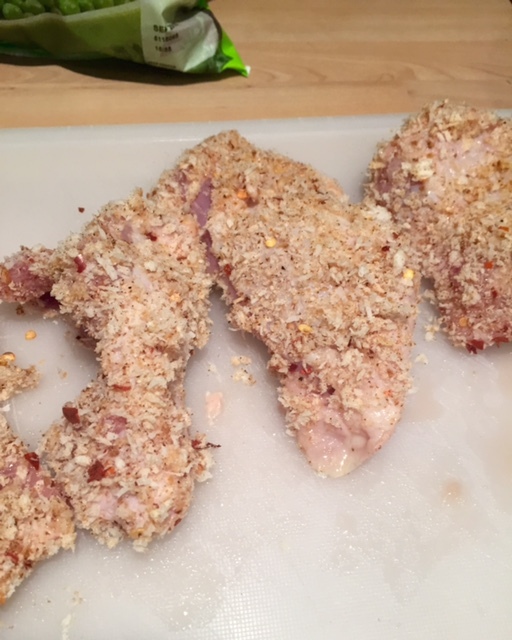 Dunk each chicken thigh into the beaten egg then the breadcrumb mixture. 11. 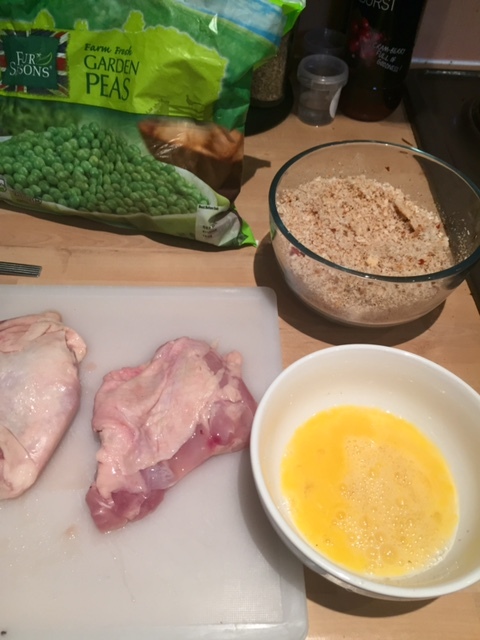 Place each chicken thigh into the warm frying pan. 12. Add the peas to the rice and let the rice cook for another 10 minutes with the lid on. 13. Turn over the peppers in the oven. 14. After the chicken has been frying for 10 minutes, turn it over. 15. Remove the peppers from the oven after they have been roasting for a total of 20 minutes. Put them to the side. 17. Mix the roasted peppers into the rice and pea mixture. 18. The chicken should now be cooked after 10 minutes on each side. 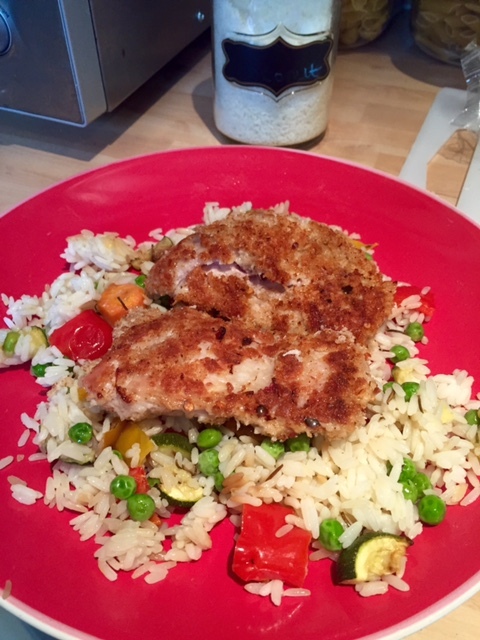 tastes or what you have in the house, including changing the vegetables (courgettes and carrots would work well too) to adding more spices into your coconut and breadcrumb mixture.